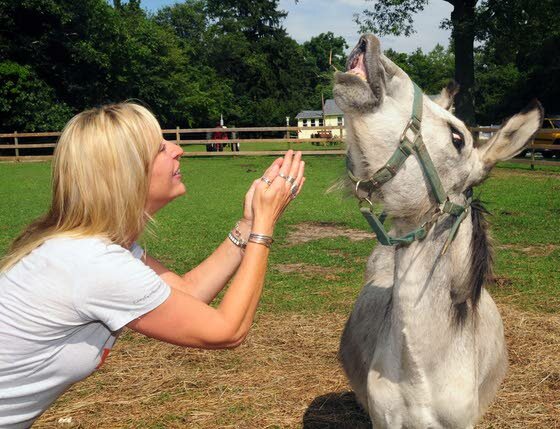 Laurie Zaleski, of Mays Landing, played with Eeyore, a rescued donkey who lives at the Funny Farm Rescue, an animal sanctuary that has been created as a home for unwanted farm animals, domestic animals and animals with special needs. Laurie Zaleski held Woody and Rosie, two rescued turkeys, at the Funny Farm. Zaleski showed Emily the emu and 600-pound Daisy the pig at Funny Farm. Visitors to Laurie Zaleski's property on the outskirts of Mays Landing will encounter a goat with one ear, a cockatiel with a missing foot and a horse that nobody can ride. These misfit animals were all unwanted by their original owners and have found a home with Zaleski at her 15-acre Funny Farm Rescue Animal Sanctuary, which gives unwanted farm, domestic and exotic animals a place to live out their natural lives while being cared for. "These are all animals that nobody wants, but they deserve to be loved and taken care of," said Zaleski, who friends teasingly call "Dr. Doolittle" because of her knack for communicating with and understanding her charges. By her estimate, there are about 170 unwanted, sick, elderly, injured and abused animals currently sheltered on the property, including 60 cats, nine pigs, seven horses, two turkeys, six goats, an alpaca, dogs, a variety of birds and dozens of rabbits, ducks and chicks. A few months ago, Felicia and Eeyore came to live at the farm. They are two donkeys who were rescued after their elderly former owner had a stroke and was unable to care for them. The friendly animals, who love to be petted on their foreheads, are 18 and 19 years old. Zaleski said that donkeys usually live into their 40s. Every year, millions of animals are euthanized throughout the United States - a majority of them due to lack of homes, special needs or age. It is especially difficult to find homes for unwanted farm animals. There are very few places in the country that are able to take in and take care for these animals, Zaleski said. But at the Funny Farm, they are happy, safe and protected. "We are often the last hope for these abused and abandoned animals," said Zaleski, who will soon celebrate her 46th birthday. "I feel what we offer is truly unique in South Jersey." The Funny Farm is a 24-hour, seven-day-a-week operation, and Zaleski has built relationships with several local and state-wide organizations that continually request its services for animal shelter and care. She takes in animals from the SPCA, the Pig Placement Network, Atlantic City Police, Atlantic County Wildlife Aid, the Humane Society and the public. Zaleski was self-funding the entire operation until about three years ago, when the Funny Farm received nonprofit status, which allowed her to fundraise to help pay for food, veterinary expenses and facility improvement to bolster the animals' quality of life. A small, sporadic volunteer staff helps Zaleski feed and care for the animals twice a day. Many of the animals need medications. And the numerous pens, cages and stalls must be kept clean. It's an enormous undertaking that Zaleski is devoted to, in addition to her full-time job at the FAA. A summer party fundraiser in June helped raise enough money to provide much-needed new roofs for the barns. Zaleski is working out the details for another much-needed fundraiser in September. She said part of her mission at the Funny Farm is to prevent cruelty to animals by increasing the awareness of animal abuse through education. She is in the process of developing a program for a youth summer day camp that would incorporate facets of animal care, organic gardening and science and technology education. Zaleski is also hoping to develop set days and hours for the public to visit, which has been hard to establish since there is no money for an official staff. Currently, she tries to accommodate visitor requests on her days off from a full-time job. "In the past, I was hesitant to advertise that we were here and ask for help because I didn't want to attract people who would see this as a dumping ground for animals," she said. "But I realized that fear is a disservice to the animals." Zaleski said she hopes spreading the word might result in getting the animals some help. Donations of any kind are always appreciated. Visitors usually bring carrots or some type of food for the animals. Sometimes people will drop off unwanted crates or small cages they longer need. And, of course, monetary donations, no matter how little, always benefits the animals, she said.